Ashton on Mersey School has a reputation for delivering an innovative and effective curriculum to suit the needs of all learners. 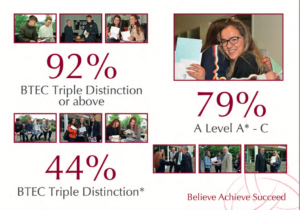 Our Sixth Form builds on this to provide a seamless transition through our 16-19 curriculum. Learning pathways focus on BTEC qualifications. Young people who do not hold a GCSE grade 4 in maths or English are required to continue these subjects as part of their study programme. All study programmes should include work experience and non-qualification activities which complement the other elements of the programme and support the student to progress to further or higher education or to employment. The Sixth Form offers a choice of four pathways, to ensure that you achieve your full potential. All our pathways at Level 3 provide a platform for access to university, apprenticeship or employment. If you already have a career in mind, you can select your pathway to match your career choice. University – All our pathways at Level 3 provide a platform for access to university. If you have a passion for one subject area and wanted to pursue this at university, Pathway 1 would provide you with the right opportunity to develop your knowledge and experience to do this. Our pathways provide a wide range of options to enable you to pursue your chosen degree pathway. Following a career pathway into an apprenticeship or employment will allow you to develop your knowledge and experience in the world of work, where you can earn while you learn. 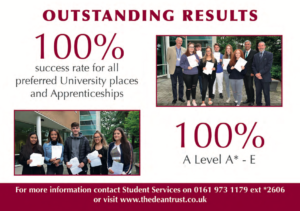 For example if you wanted to pursue an apprenticeship or career in Business and Finance you could chose to study Business and complement this with Accountancy by following Pathway 3. Pathway 1 and focus on your chosen career goal. 5 Full Course GCSEs at grade 9-4 including English Language and Mathematics at grade 4 or above.